Ogle, Klemp and McBride advise against inefficient vocabulary acquisition strategies such as looking words up in the dictionary or isolated phonics instruction. They advocate for increasing independent reading in order to promote vocabulary development. It can be difficult for secondary non-ELA content teachers to provide the time and appropriate materials for independent reading in their classes. Readers have many encounters with large numbers of words. These encounters help them relate the word to their own prior knowledge and experiences and give them practice in using their growing knowledge of these words to make inferences (Nagy, 1988, p. 32). A student’s vocabulary growth depends on multiple exposures to new words in a variety of contexts. Learning new words requires integration, repetition, and meaningful use. New terms need to be integrated with what students already know. New terms need to be taught and retaught in multiple contexts. Students need to use new terms in ways that are meaningful to them. Research suggests that the human brain actively “looks” for similar information to make sense of incoming data (Jensen, 1998; Sousa, 2001; and Sprenger, 1999). Thus, learning activities that help students connect what they know to what they are about to learn can positively affect comprehension. The authors recommend concept mapping, discovering similarities and differences, and predicting ABCs as strategies that help students activate their prior knowledge. Concept definition or semantic mapping is when students work in small groups to use context clues to guess at a word’s meaning. Then the students list all of their definitions and vote on the best one. Students also come up with at least three characteristics, synonyms and/or properties of the key word or concept. Lastly, the teacher should ask students for non-examples or contrasts. 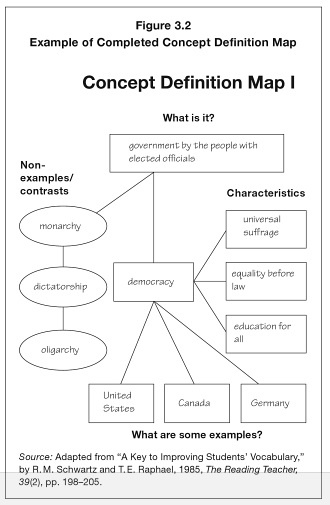 The figure below illustrates how a group of students defined “democracy”. An outcome of the concept-mapping process is that students learn how to discover similarities and differences between ideas. 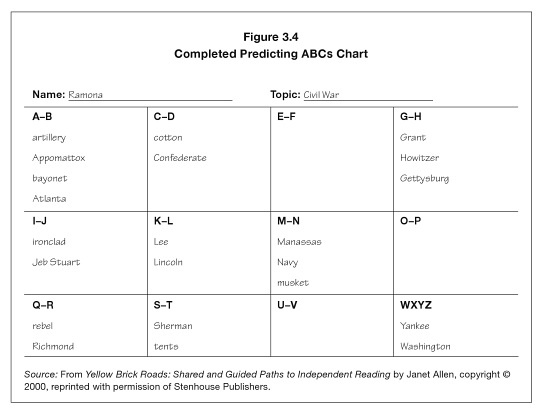 Students can complete a Y-chart as they read and then determine how two terms, events or people are alike. Then, students separate out the differences as they discuss the terms. Students draw lines through similarities in the top part of the chat and adds them to the bottom section. This chart works well helping students examine the differences in social studies terms like socialism and communism. The Predicting ABCs graphic organizer allows small groups of students to share word lists and explain to each other what each term means. After skimming a chapter, students are asked identify words they think their classmates might struggle with. Then they turn to an elbow partner and discuss the words they listed in E-F. Students can move into groups and share words with the whole class. When a student lists a word, the entire class adds it to their ABCs sheet. Then the teacher can provide whole class instruction interpreting and explaining the words. Now the class is ready to read. There are many more resources in this information-rich chapter. In fact, this whole book is full of graphic organizers that can be adapted for use in elementary, middle and high school Social Studies classes. I like the authors’ technique of using a model teacher that encounters and solves classroom problems in each chapter. In the past, I have conducted vocabulary tweetathons and six word definitions/memoirs. When I was a middle school teacher, I used to have students create Foldables from Dinah Zike’s videos. A few years ago, when I moved into a 1:1 environment, I had the students create flash cards and play study games on Quizlet, which led me to experiment with other vocabulary-based video games. What tricks and tips do you have for teaching content-specific vocabulary? Ogle, D., Klemp, R., and McBride, B. (2007). 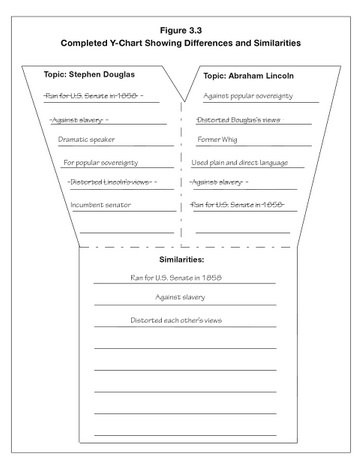 Building Literacy in Social Studies: Strategies for Improving Comprehension and Critical Thinking . Ch. 3 (pp. 33-52). ASCD. This post draws from Chapter Three (pp. 33-52) in Building Literacy in Social Studies: Strategies for Improving Comprehension and Critical Thinking (Ogle, Klemp & McBride, 2007). One of the most successful strategies in improving a student’s vocabulary is providing time to read. Students do not learn most words through direct instruction. Researchers estimate that a student learns 3,000 new words per year (Nagy, Anderson, and Herman, 1987). Wide reading is a major contributor to differences in children’s vocabularies. Increasing the volume of student reading is the single most important thing a teacher can do to promote large-scale vocabulary growth (p.32). 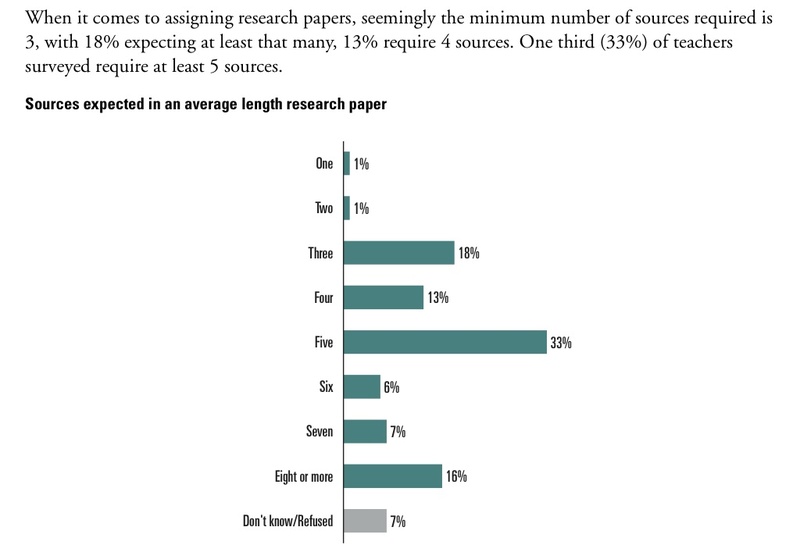 Thus, history and social science classes that build non-fiction and historical fiction reading into their everyday classroom practices often show large gains that help students build on their prior knowledge. Marzano estimated that 55% of a student’s academic vocabulary comes from reading Social Studies texts. The state of California keeps a searchable database of recommended literature by grade level for precisely this reason. While California takes a hiatus from standardized testing in History-Social Studies (ETS is redesigning our end of year accountability exams) I am turning my 9th grade World History class into a World History Through Literature class. I am fortunate in that I work with a great group of English teachers who support me in this endeavor. They are willing to be flexible with their pacing plans so that we can align our instruction and have students read relevant literature during World History units. Here is draft of our book list. As you can see in the chart below, there are staggering differences in vocabulary acquisition via independent reading. This explains why educators recommend students read 30 minutes independently every day. The average student arrives in my 9th grade World History class reading below the 6th-grade level, which explains why many History teachers opt for lecturing, instead of asking students to read Social Studies texts, which are above their zones of proximal development (ZPD). 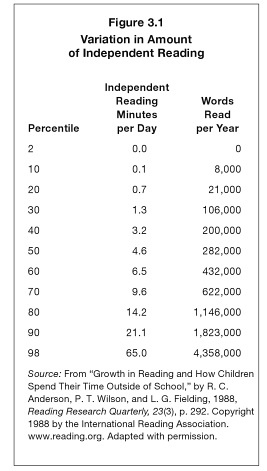 Armed with this data, it would be educational malpractice to not incorporate independent reading in my classroom. 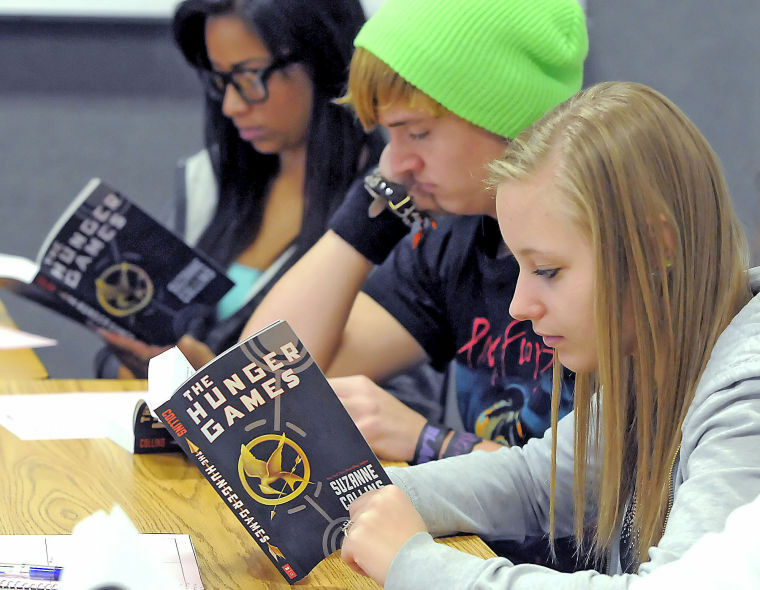 One strategy the authors recommend to get students reading is a Book Pass session. This is where students pass around books, reading the jacket copy and noting on a chart whether they Want to Read, Might Want to Read or Don’t Want to Read the selections. This helps reluctant readers commit to certain titles. It is important to tell students to choose something that is fun and easy to read, as struggling readers often will choose something difficult and “fake read” it in front of their peers. My next post will discuss more strategies for teaching vocabulary to older students. This year end project is designed to teach persistence and interviewing skills. I am asking each student to call a Vietnam Veteran’s organization in a different state and conduct a 20 minute phone interview with a Vietnam Vet. All of the interview questions will be written in class, along with phone scripts, which will be rehearsed. Inform your parents about this project. Get parental permission before making long distance phone calls. Do not disclose your last name, school name, or location to anyone you interview. Do not give your cell phone number to anyone you interview. If your interviewee says anything inappropriate, or makes you uncomfortable, thank them for their time, hang up the phone, document it on your phone log, and promptly report it to your parents and teacher. Hi, this is _________, a HS student calling from CA. 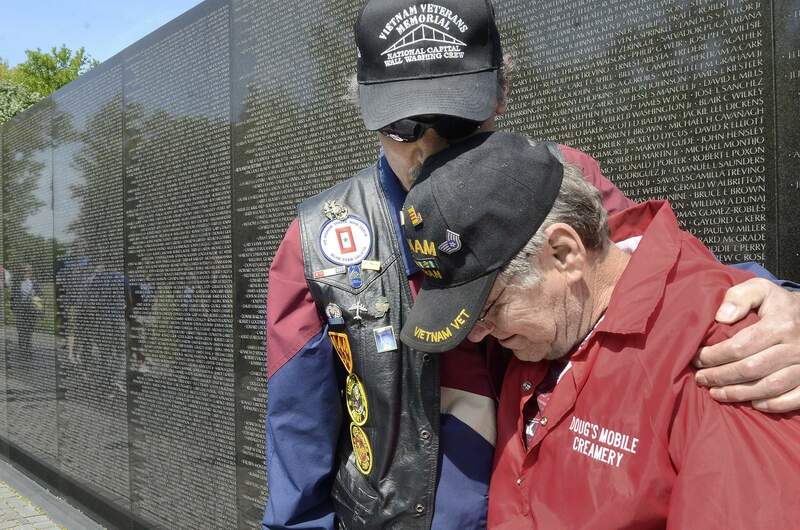 I need to interview a Vietnam Vet for a school project. Would you know anyone willing to speak with me on the phone for 20-30 minutes? Later, when you have found someone willing to talk to you, ask permission to record the phone call. Explain that you will be typing a transcript of the interview. (See Dr. Petri, who will record every phone number you are given). Improving Historical Reading & Writing is a free Massive Online Open Course offered through the Canvas Network (www.canvas.net). 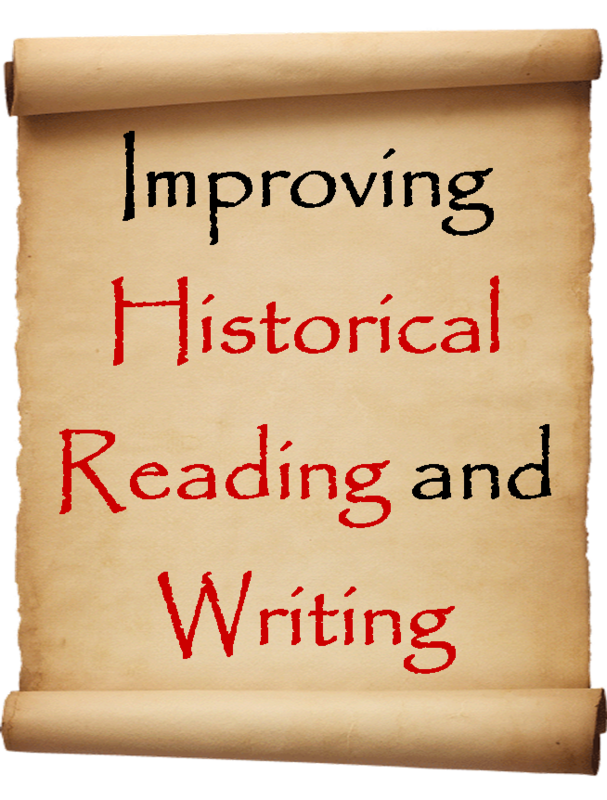 The course is designed to help history teachers improve their skills in teaching historical reading and writing. The MOOC will be organized into 15 online modules that will be open from June 22 – Sept. 7. Each module will contain multiple resources, 3-5 short lecture videos, 2-3 readings, 2-4 online discussions and an online quiz. Course participants will be able to choose which modules to participate in and will have flexible deadlines when completing course work. Course completers will receive a grade based on reading and video quizzes and can earn badges and/or certificates of completion. There is also an option to purchase graduate credit from Ashland University for work completed. Themes for the modules are listed below. Click HERE to enroll. The Common Core State Standards call for teachers to emphasize argumentative, informative, and narrative writing in their classroom practices. This course will help history teachers become writing teachers who teach skills and content simultaneously. Click here to enroll. For questions, contact Corbin Moore at corbinmoore1@gmail.com or Scott Petri at scottmpetri@gmail.com.